Today I had the chance to testify before the House Small Business Committee on the many tax issues facing small business. Here are my opening remarks. You can find my full testimony here. America’s tax system is needlessly complex, economically harmful, and often unfair. Despite recent revenue gains, it likely will not raise enough money to pay the government’s future bills. The time is thus ripe for wholesale tax reform. Such reform could have far-reaching effects, including on small business. To help you evaluate those effects, I’d like to make seven points about the tax issues facing small business. 1. Tax compliance places a large burden on small businesses, both in the aggregate and relative to large businesses. The Internal Revenue Service estimates that businesses with less than $1 million in revenue bear almost two-thirds of business compliance costs. Those costs are much larger, relative to revenues or assets, for small firms than for big ones. 2. Small businesses are more likely to underpay their taxes. Because they often deal in cash and engage in transactions that are not reported to the IRS, small businesses can understate their revenues and overstate their expenses and thus underpay their taxes. Some underpayment is inadvertent, reflecting the difficulty of complying with our complex tax code, and some is intentional. High compliance costs disadvantage responsible small businesses, while the greater opportunity to underpay taxes advantages less responsible ones. 3. The current tax code offers small businesses several advantages over larger ones. Provisions such as Section 179 expensing, cash accounting, graduated corporate tax rates, and special capital gains taxes benefit businesses that are small in terms of investment, income, or assets. 4. Several of those advantages expired at the end of last year and thus are part of the current “tax extenders” debate. These provisions include expanded eligibility for Section 179 expensing and larger capital gains exclusions for investments in qualifying small businesses. Allowing these provisions to expire and then retroactively resuscitating them is a terrible way to make tax policy. If Congress believes these provisions are beneficial, they should be in place well before the start of the year, so businesses can make investment and funding decisions without needless uncertainty. 5. Many small businesses also benefit from the opportunity to organize as pass-through entities such as S corporations, limited liability companies, partnerships, and sole proprietorships. These structures all avoid the double taxation that applies to income earned by C corporations. Some large businesses adopt these forms as well, and account for a substantial fraction of pass-through economic activity. 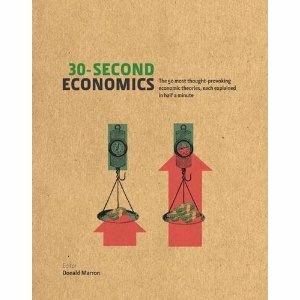 Policymakers should take care not to assume that all pass-throughs are small businesses. 6. Tax reform could recalibrate the tradeoff between structuring as a pass-through or as a C corporation. Many policymakers and analysts have proposed revenue-neutral business reforms that would lower the corporate tax rate while reducing tax breaks. Such reforms would likely favor C corporations over pass-throughs, since all companies could lose tax benefits while only C corporations would benefit from lower corporate tax rates. 7. Tax reform could shift the relative tax burdens on small and large businesses. Some tax reforms would reduce or eliminate tax benefits aimed at small businesses, such as graduated corporate rates. Other reforms—e.g., lengthening depreciation and amortization schedules for investments or advertising but allowing safe harbors for small amounts—would increase the relative advantage that small businesses enjoy. The net effect of tax reform will thus depend on the details and may vary among businesses of different sizes, industries, and organizational forms. It also depends on the degree to which lawmakers use reform as an opportunity to reduce compliance burdens on small businesses. Would a Carbon Tax and Corporate Tax Reform Taste Great Together? Two great tastes often taste great together. Chocolate and peanut butter. Oreos and milk. Popcorn and butter. Could the same be true of carbon taxes and corporate tax reform? Done right, each could be flavorful. But would they be even tastier together? My Tax Policy Center colleague Eric Toder and I explore that question in a new paper. We find that using a carbon tax to help pay for corporate tax reform has several attractions and one big drawback. A well-designed tax swap could combat climate change, make our corporate tax system more competitive, and reduce long-term deficits, but would be quite regressive, increasing tax burdens on most Americans while cutting them on those with the highest incomes. Let’s start with the good news. Putting a price on carbon dioxide and other greenhouse gases would be an efficient way to reduce future emissions, encourage greener technologies, and reduce future risks of climate change. A carbon tax would make real the adage that you should tax things that you don’t want–like pollution–rather than things you do. A carbon tax could also raise substantial revenue. One common proposal, a $20 per ton tax rising at 5.6 percent annually, would raise north of $1 trillion over ten years. That money could help reduce future deficits, pay for offsetting tax cuts, or a combination of both. Which brings us to corporate reform. Just about everyone wants to cut America’s corporate tax rate, now the highest in the developed world. President Obama wants to lower the federal rate from 35 percent to 28 percent. Many Republicans, including House Ways and Means Chairman Dave Camp, hope to get down to 25 percent or even lower. But they are all having a hard time finding a way to pay for such rate cuts. It’s easy to talk about closing “loopholes” and “special interest” tax breaks in the abstract, but in practice it’s difficult to cut back enough to make such large rate cuts. Enter the carbon tax. A reasonable levy could easily pay for cutting the corporate tax rate to 28 percent or even lower. In fact, such rate cuts would require only a fraction of carbon revenues if lawmakers also identify some significant tax breaks to go after. The remaining carbon revenues could then finance deficit reduction or other policies. Cutting the corporate tax rate would boost the U.S. economy, reduce many distortions in our existing code, and weaken multinationals’ incentives to play accounting games to avoid U.S. taxes. The resulting economic gains might even be enough to offset the economic costs of the carbon tax. That’s a tasty recipe. Except for one missing ingredient: fairness. Like other consumption taxes, a carbon tax would fall disproportionately on low-income families. Cutting corporate income taxes, on the other hand, would disproportionately benefit those with higher incomes. A carbon-for-corporate tax swap would thus be quite regressive. Eric and I used TPC’s tax model to measure this regressivity for a stylized carbon tax that would raise revenues equal to 1 percent of American’s pre-tax income. As illustrated by the light blue bars in the chart below, that carbon tax would boost taxes by more than 1 percent of pre-tax income for households in the bottom four income quintiles—1.8 percent, for example, in the lowest fifth of the income distribution. The increase would be smaller at higher incomes. Folks with the highest incomes would bear a significantly lower relative burden—just 0.75 percent of their pre-tax income, for the top 20 percent of households. Pairing a carbon tax with an offsetting cut in corporate taxes would make things more regressive (dark blue bars). Lower corporate rates would benefit taxpayers at all income levels, workers and investors alike. But the biggest savings would go to high-income households. 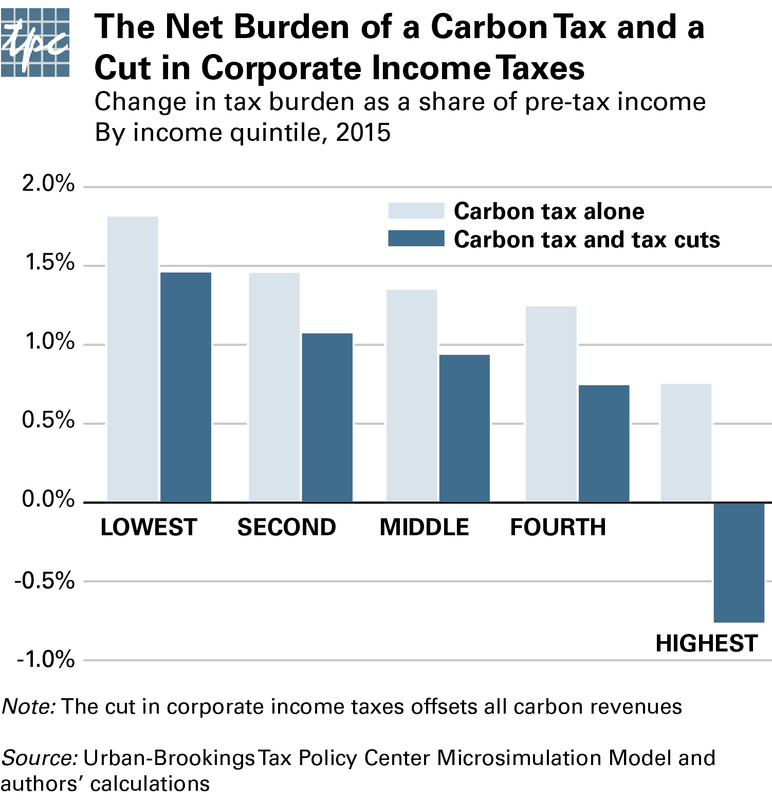 Cutting corporate taxes offsets less than a third of carbon tax burden for households in the first three income quintiles, but more than offsets the carbon tax burden in the highest-income group. The net effect would be a tax cut for high-income taxpayers, and tax increases for everyone else. That regressivity is a serious concern. A carbon-for-corporate tax swap may be a recipe for environmental and economic improvement, but it isn’t a complete one. As Eric and I discuss in the paper, lawmakers should therefore consider other policy ingredients—per capita credits, for example—that could help protect low-income households and potentially make a carbon-for-corporate tax swap a more balanced policy option. 1. $5 trillion is the gross amount of tax cuts he has proposed, not the net impact of all his intended tax reforms. Governor Romney has been very specific about the taxes he would cut. Most notably, he would reduce today’s individual income tax rates by one-fifth (so the 10 percent bracket would fall to 8 percent, the 35 percent to 28 percent, etc.) and reduce the corporate income tax rate from 35 percent to 25 percent. In addition, he would eliminate the alternative minimum tax (AMT), the estate tax, the taxes created in 2010’s health reform act, and taxes on capital gains, dividends, and interest for incomes up to $200,000 ($100,000 for singles). The $5 trillion figure reflects the revenue impact of all those cuts. But Romney has also said that he intends his reforms to be revenue-neutral, with the specified revenue losses being offset by a combination of economic growth and unspecified cuts in deductions and other tax preferences. The net impact of his reforms would undoubtedly be less than $5 trillion, perhaps much less if he’s aggressive in going after tax breaks or willing to compromise on some of his other tax reform goals (e.g., not raising taxes on investment income). Without any details about what he would do, however, we can’t measure the net revenue impact of his ideas. 2. $5 trillion is a 10-year extrapolation from a TPC estimate for 2015. TPC has estimated that the gross tax cuts proposed by Romney would amount to $456 billion in 2015. Budget debates in Washington often focus on ten-year periods, so commentators have coalesced around a natural, if imprecise, extrapolation: multiply by 10 and round up because of a growing economy. Result: $5 trillion over ten years. 3. $5 trillion does not include the impact of permanently extending many expiring tax cuts, including those from 2001 and 2003. In budget parlance, the $5 trillion is measured against a current policy baseline, not a current law one. TPC’s current policy baseline assumes that many expiring tax cuts, including the 2001 and 2003 cuts, the AMT patch, the current version of the estate tax, and the tax credits enacted or expanded in 2009 will all be extended permanently. Romney proposes to extend all of these except the 2009 credits. Because it is measured against current policy, the $5 trillion figure does not include the revenue impact of any of those extensions (but does include a small revenue increase from expiration of the credits). 4. $5 trillion includes more than $1 trillion in gross tax cuts for families earning $200,000 or less. Governor Romney’s specified tax cuts would go primarily to high-income taxpayers for a simple reason: they pay a large share of taxes and thus get a large benefit from a proportional reduction in tax rates. But that doesn’t mean that all the tax cuts go to top earners. Middle- and upper-middle income taxpayers would also get a gross tax reduction because of the reduction in tax rates, the elimination of taxes on capital gains, dividends, and interest for low and middle incomes, and, for some, the elimination of the AMT. Those gross tax cuts amount to more than $1 trillion over ten years. 5. $5 trillion includes around $1 trillion in gross tax cuts for corporations. Cutting the corporate income tax rate from 35 percent to 25 percent would lower corporate tax revenues by roughly $1 trillion over the next decade. Little-discussed in the current debate is whether and how Governor Romney would offset this revenue loss. As he has rightly noted, corporate taxes are ultimately borne by people, including workers and shareholders. Most of the corporate rate reductions would ultimately benefit high-income taxpayers since they own more investment assets and earn higher labor income. But about two-fifths of the benefit would go to low-, middle-, and upper-middle income workers and investors. Bottom line: Governor Romney has proposed about $5 trillion in specific, gross tax cuts over the next decade relative to current policy, most but not all of which would go to high-income taxpayers. He has also promised to offset a substantial portion of those cuts—presumably in the trillions of dollars—by reducing deductions and other tax breaks, primarily for high-income households. Lacking any specifics, however, we can’t know what net tax cut, if any, he proposes. How Big Are Tax Preferences? The tax code is chock full of credits, deductions, deferrals, exclusions, exemptions, and preferential rates. Taken together, such tax preferences will total almost $1.3 trillion this year. That’s a lot of money. But it doesn’t necessarily mean that $1.3 trillion is there for the picking in any upcoming deficit reduction or tax reform. In fact, even if Congress miraculously repealed all of these tax preferences, it would likely generate much less than $1.3 trillion in new resources. Where did I come up with that number? For a short piece in Tax Notes, I simply added together all the specific tax expenditures identified by the Department of Treasury; these were reported in the Analytical Perspectives volume of the president’s recent budget. Treasury doesn’t report this total for a good, technical reason: some provisions interact with one another to make their combined effect either larger or smaller than the sum of their individual effects. As a result, simple addition won’t give an exact answer. That’s an important issue. In the absence of a fully integrated figure, however, I think it’s useful to ballpark the overall magnitude using basic addition. In your travels, you may find other estimates that do the same thing but come up with a figure of “only” $1.1 trillion. Why is mine higher? Because it includes some important information that Treasury reveals only in footnotes. Treasury’s main table estimates how tax expenditures reduce individual and corporate income tax receipts; those effects total $1.1 trillion. But they also have other effects. Refundable credits like the earned income tax credit increase outlays, for example, and some preferences, like those for employer-provided health insurance and alcohol fuels, lower payroll and excise taxes. I include those impacts in my $1.3 trillion figure. Budget hawks and tax reformers have done a great job of highlighting tax expenditures in recent years. I fear, however, that we have lifted expectations too high. Just because the tax code includes $1.3 trillion in tax preferences doesn’t mean it will be easy to reduce the budget deficit or pay for lower tax rates by rolling them back. Politics is one reason. It’s easy to be against tax preferences when they are described as loopholes and special interest provisions. It’s another thing entirely when people realize that these include the mortgage interest deduction, the charitable deduction, and 401(k)s.
Basic fiscal math is another challenge. Tax expenditure estimates do not translate directly into potential revenues. Indeed, there are several reasons to believe that the potential revenue gains from rolling back tax preferences are less than the headline estimates. One reason is that the estimates are static—they measure the taxes people save today but do not account for the various ways that people might react if a preference were reduced or eliminated; those reactions may reduce potential revenues. Second, most reforms would phase out such preferences rather than eliminate them immediately. That too reduces potential revenues, at least over the next decade or so. Finally, the value of tax preferences depends on other aspects of the tax code, most notably tax rates. If a tax reform would lower marginal tax rates, the value of deductions, exclusions, and exemptions would fall as well. Suppose you are in the 35 percent tax bracket. Today, each dollar you give to charity results in 35 cents of tax savings—a 35-cent tax expenditure. If the top rate were reduced to 28 percent, as some propose, your savings from charitable donations would be only 28 cents. The 20 percent reduction in tax rates would thus slice the value of your tax expenditure by 20 percent. That means that the revenue gain from eliminating the deduction—or any other similar tax expenditures—would also shrink by 20 percent, thus making it harder for tax expenditure reform to fill in the revenue gap left by reducing tax rates. My message is thus a mixed one. Tax expenditures are very large—$1.3 trillion this year alone if you add up all the individual provisions – and deserve close scrutiny. But we need to temper our aspirations of just how much revenue we can generate by rolling them back. It isn’t as though there’s an easy $1.3 trillion sitting around. In coming months, the Tax Policy Center will explore how to translate tax expenditure figures into more reasonable estimates of the potential revenues that tax reformers and budget hawks can bargain over. P.S. For an interesting analysis of how individual tax preferences interact with each other, see this piece by TPC’s Dan Baneman and Eric Toder. April 1 is often a day for pranks. In the tax world, however, it will mark something more serious. Barring another Fukushima Daiichi-like catastrophe (which delayed its plans last year), Japan will cut its corporate tax rate by five percentage points. That move will leave the United States with the highest corporate tax rate in the developed world: 39.2 percent when you add state and local taxes to the 35 percent federal rate. The corporate income tax is a particularly problematic way to collect tax revenues. Corporate taxes are often more harmful for economic growth than ones on personal income or consumption, as noted in a recent study by the Organization for Economic Cooperation and Development. Moreover, a high corporate rate is an invitation for US multinationals to play games with their accounting, locating profits overseas while reporting as many tax-deductible expenses as possible here at home. That’s why there’s a growing bipartisan consensus that the federal rate needs to come down. President Obama recently proposed lowering it to 28 percent. His likely Republican challenger, Mitt Romney, wants to bring it down to 25 percent. But corporate tax reform can’t just be about lowering the statutory rate. America faces enormous budget challenges and cannot afford to simply cut future revenue. Moreover, the high statutory rate isn’t the only problem with our system. The code is riddled with tax subsidies and loopholes. Those tax breaks, more generous than those in many nations, reduce corporate tax burdens significantly. That leaves us with the worst possible system. It maximizes the degree to which corporate managers must worry about taxes when making business decisions but limits the revenue that the government actually collects. One side effect is that the system plays favorites among different businesses. Retailers and construction companies, for example, pay an average tax rate of 31 percent, according to recent Treasury Department calculations, while utilities pay only 14 percent and mining companies (which include fossil fuel producers) pay only 18 percent. I know of no reason why the tax system should favor utilities and mining while hitting construction and retailers so hard. Far better would be a system in which investors deployed their capital based on economic fundamentals, not the distortions of the tax system. Another problem is that the system perversely favors debt financing over equity. Interest payments are tax-deductible, while dividends are not. Corporations thus have a strong incentive to finance their investments by borrowing. Given what our economy’s been through, it is hard to believe that the tax system ought to subsidize more debt. The solution to all this is to reduce the corporate tax rate while taking a hatchet to many corporate tax breaks. Done right, that would level the playing field across different businesses and between equity and debt and maintain revenues. Mr. Obama and Mr. Romney have proposed reforms along these lines, albeit with much more clarity about the rate-cutting than the base-broadening. That isn’t surprising. Leveling the playing field (while maintaining revenues) will require that some companies pay more so others can pay less. Politicians would rather focus on potential winners, not losers. But losers there will be. The US Chamber of Commerce has said that it “will be forced to vigorously oppose pay-fors [tax increases] that pit one industry against another.” But such pitting is exactly what will be necessary to enact comprehensive corporate tax reform. P.S. You might be wondering what tax breaks I would cut in order to lower corporate tax rates. I haven’t had a chance to put together a complete package, but a starting point would be the domestic production credit (a subsidy for manufacturing), many energy subsidies (the ones for fossil fuel don’t make much sense, and I’d rather we use taxes than tax subsidies to encourage greener energy production), and the benefit of debt finance (e.g., by limiting deductibility of interest). Interest deductibility isn’t usually viewed as a tax break, but it leads to perverse effects when combined with favorable depreciation rules. Many propose rolling back those depreciation rules, but given the overall tax preference for debt, it’s worth considering limiting interest deductibility instead.